The Judicial Performance Commission recommends that the Honorable Douglas R. Manley BE RETAINED by a vote of nine (9) to one (1) with no abstentions. 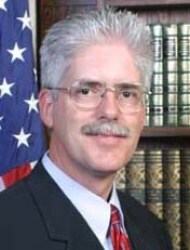 Judge Manley received his legal training at the University of Colorado. A long-time resident of La Junta, Judge Manley has worked in many aspects of the region’s legal community, having served as a deputy district attorney from 1978 until 1982 and then working in private practice until his appointment as Otero County Judge in 2004. Judge Manley still maintains a small private legal practice, and continues to work on behalf of children by serving as a guardian ad litem. The Commission reviewed the results of the 2014 Judicial Performance Survey Report gathered from litigants, jurors and attorneys who appeared before Judge Manley during the years 2010-2013. Responses during that period showed Judge Manley’s overall grade on a 4.0 grade point scale was a combined 3.31, with attorneys giving Judge Manley a grade of 3.22 and non-attorneys giving Judge Manley a grade point average of 3.40. Of all attorneys surveyed about retention, 82% recommended retaining, 12% recommended not to retain, and 6% made no recommendation. Of non-attorneys surveyed, 79% recommended retaining, 11% not to retain, and 10% made no recommendation. (These percentages may not add up to 100% due to rounding.) The Commission notes a small sample size of only 208 participants in four years. The Commission heard from the head of the La Junta Regional Office of the Colorado State Public Defender and conducted a public hearing. All Commission members observed Judge Manley working in the courtroom and reviewed written materials provided by the Judge, the Court administrative staff, interested parties, citizens, and attorneys, as well as case statistics for Otero County Court. Finally, the Commission conducted an interview with Judge Manley, discussing the evaluation process and any and all concerns of the Commission. The Commission gives Judge Manley high marks for his legal scholarship, the clarity of his written and oral rulings, his compassionate demeanor, his dedication to continuing legal education, and his service to the greater community. Consensus of the Commission was that Judge Manley is a “good judge”. All members felt he showed respect to litigants. The Commission did identify several concerns with Judge Manley’s procedures. Judge Manley was questioned for his practice of entering “not guilty” pleas for criminal defendants at their first appearance before the court and prior to the defendant’s opportunity to speak with counsel. In addition, Judge Manley has also scheduled a significant portion of his criminal docket during days when he was unavailable. A majority agreed this practice was not ideal and suggested an “on the record” docket to hold attorneys more accountable for efficient case management. Also noted were deficiencies in the quality of the advisement of rights given during the mass advisements of multiple defendants in criminal cases, especially those appearing without an attorney. The Commission questioned whether the Judge’s description of the defendant’s rights, in particular a defendant’s right to counsel, was thorough enough. Many of these complaints, though not all, could be resolved through cooperation with attorneys and staff and a re-examination of administrative work flow.